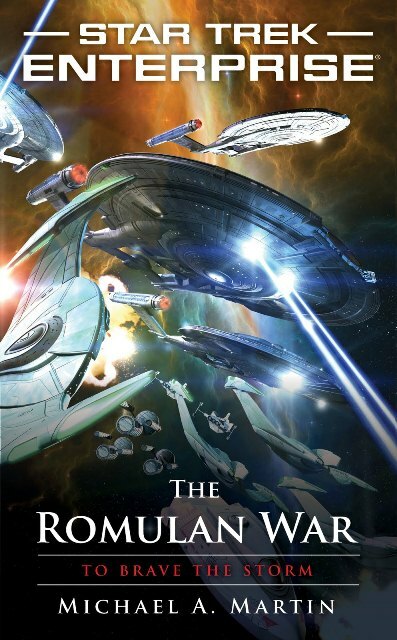 The concluding novel in author Michael A. Martin’s The Romulan War series chronicles the closing years of the Earth-Romulan war. As the Romulans continue to attack Coalition forces and colonies, Earth finds itself holding the front alone as her allies, Vulcan, Andor and Tellar, all decline to enter the fray. However, the Terrans are dangerously outnumbered and as the war rages on the prospects look increasingly grim for Starfleet and Earth. Having followed the post-finale Enterprise novels closely I was eagerly anticipating the release of To Brave the Storm. The decision to explore the Earth-Romulan conflict in the novels was a brilliant one that signalled a positive change of pace from the television series. As someone who always felt that Trip got a raw deal in These are the Voyages… I was also an enthusiastic supporter of both the decision to reinterpret events as seen in the finale and of the continuing relationship between Trip and T’Pol which Martin has always written with great skill. However, after thoroughly enjoying the first three post-finale books, I found To Brave the Storm a little unsatisfying. To Brave the Storm has a very, very broad scope. It covers, in total, an epic 30 years. The plot moves briskly from one key historical event to the next, but in the process I felt that the story left the characters behind. In fact, the necessity of squeezing so much history into one novel seemed to reduce the character arcs into afterthoughts added as an aside when there was a spare moment. Although Martin tried to find time for every character many didn’t get the attention I felt they deserved, this was particularly true of Mayweather, Sato, Phlox and Reed. To Brave the Storm could easily have been used as an outline for 10 or 15 novels and personally I feel this would have been preferable. Without spoiling the ending, the timespan that the novel covers and the way that Martin concludes certain arcs could put severe restrictions on what can be done in any future novels if they are forced to work around events as Martin has established them here. However, I did enjoy the historical style that Martin used and the parallels between World War II and the Earth-Romulan conflict.